WORKOUT WEDNESDAY: Debunking Five Myths About Yoga in Celebration of National Yoga Month! This blog post was written by Emily Wheeler and is published as a part of our blog exchange with Campus Rec blog Tar Heel Tone-Up. First of all, there are various types of yoga that range from slow and meditative to quick-paced power classes that will have you sweating in minutes. A nice thing about yoga is that you can find what you’re looking for, and some people come to yoga for exercise and some do not. Some individuals really enjoy the slow-paced classes as more of a mental experience than a physical form of exercise, and for those people, it’s not boring at all—it serves a purpose. Others really enjoy higher intensity yoga and some even use it exclusively as exercise, and there are plenty of classes to serve that purpose as well. I have a friend who is an avid swimmer and claimed that he didn’t think yoga was “real exercise” once, so I invited him to a power yoga class with me and he was literally dripping sweat onto his mat halfway through the class. He started coming to that class regularly to improve his strength and flexibility in between swim practices. It is certainly true that practicing yoga in a privately owned studio can be expensive, but yoga doesn’t have to be exclusive to a certain few who can afford it. Yoga can be done at home on a mat in your living room using a DVD or countless online videos as guidance. Some people even begin to practice yoga on their own without any instruction after gaining enough experience. If you like the feeling of community and encouragement that comes from doing a class together with others, UNC Campus Recreation offers free group fitness yoga classes to all students and employees with memberships every week. You can even do yoga outside for a fun new experience and some literal fresh air. 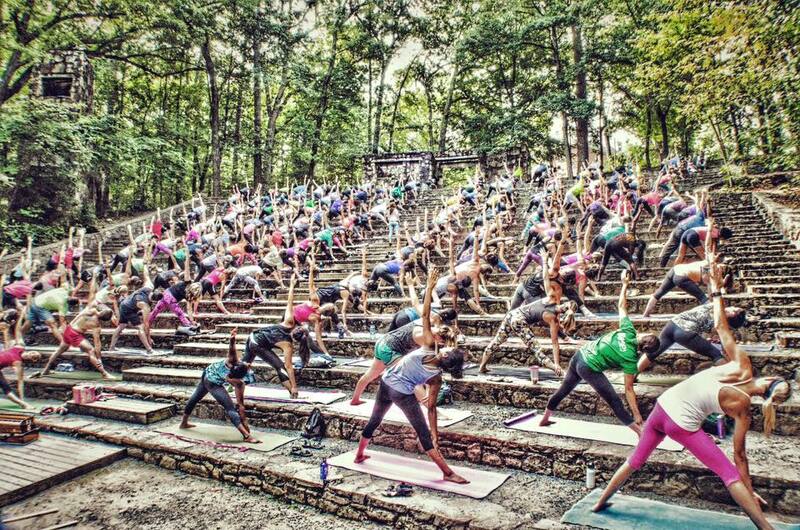 This photo was taken on August 29 at a free outdoor yoga class that was held in the Forest Theater on Country Club Road, on the border of UNC’s campus. The class was offered by Franklin Street Yoga Center, and in honor of National Yoga Month, they are offering a free week of yoga during the month of September for any group, club, or organization that is interested. You can contact them directly to take advantage of this amazing opportunity! First of all, what does that even mean? “Hippie” is a word from the 70’s in my mind. Yoga is for people who want something that will help them to improve their health (mental and physical), physical strength, focus, and that gives them an opportunity to step away from the stress of everyday life. From the many people I have met at yoga classes, yoga is for men, women, teachers, physicians, fitness instructors, that kid you met at the bus stop yesterday, stay-at-home moms, and ridiculously busy college students. To me, yoga is for absolutely everyone who is willing to try it. Movies, TV shows, and magazines have this great ability to convince people that only tall, thin, impossibly beautiful women do yoga. However, if you walk into a real yoga class you find real people: people of all shapes and sizes and ages and backgrounds who have come to practice yoga for any of a huge variety of reasons. Most REAL people are not very flexible when they start doing yoga. That flexibility comes and improves with a significant amount of time and practice. You also don’t need to fall into a specific body type category to be fantastic at yoga. And the good news is, you don’t actually have to be fantastic at yoga at all! Real yoga classes are made of real people who shake and wobble and fall down and try again. I think there are plenty of reasons why you usually see more women in yoga classes than men: many men feel that to be “manly” they should exercise in a weight room, or that yoga will be considered “feminine” by other men, or simply because women have been shown to pay more attention to their physical and mental health needs than men. However, I did say that there are typically less men than women in yoga classes, but there are not zero men. There are plenty of men who have had the courage to try yoga and have realized that it really is for everyone, and I personally admire the many men who are far more advanced at yoga than me. If you’ve never tried it before, I encourage you to try yoga without any preconceived notions and an openness to a new experience. You might find yourself on the way to reaching a little haven of peace, health, and balance that you never even know you need in your life until you find it. Next Article Wellness/Health Messaging Graphic Design Intern Wanted!